^ a b "Iran" in Encyclopedia of Islam, Leiden. C.E. Bosworth (editor): Persians (65 percent), Azeri Turks (16 percent), Kurds (7 percent), Lurs (6 percent), Arabs (2 percent), Baluchis (2 percent), Turkmens (1 percent), Turkish tribal groups such as the Qashqai (1 percent), and non-Persian, non-Turkic groups such as Armenians, Assyrians, and Georgians (less than 1 percent). Library of Congress, Library of Congress – Federal Research Division. 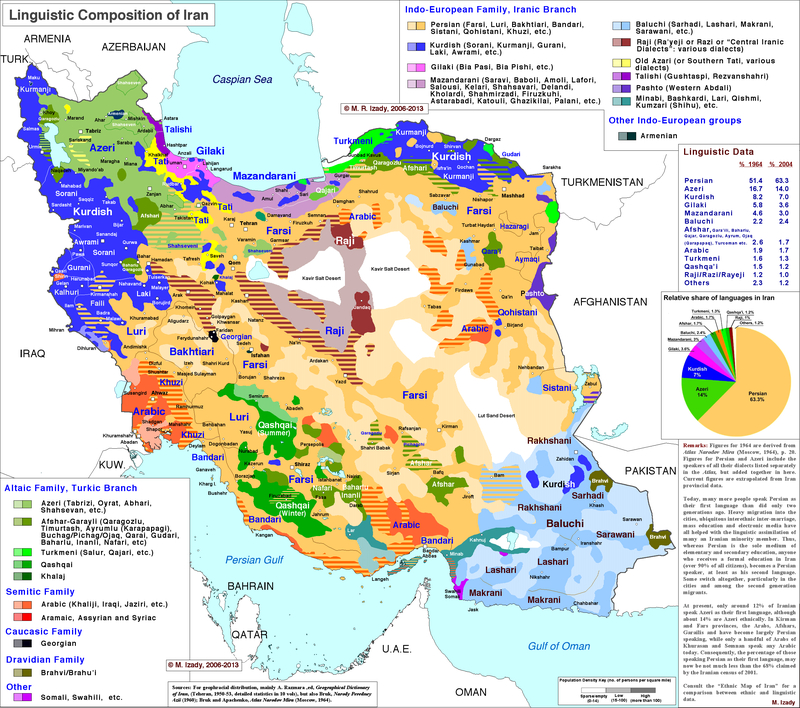 "Ethnic Groups and Languages of Iran" (PDF). Retrieved 2 December 2009. ^ a b "Contemporary Iran : Economy, Society, Politics: Economy, Society, Politics - Google Books". Books.google.com. 5 March 2009. Retrieved 21 September 2015. ^ a b "World and Its Peoples - Marshall Cavendish". Books.google.com. 1 September 2006. Retrieved 21 September 2015. ^ Russell Contrera (8 August 2009). "Saving the people, killing the faith - News - Holland Sentinel - Holland, MI". Holland Sentinel. Archived from the original on 6 March 2012. Retrieved 21 September 2015. ^ a b "The World Factbook". Cia.gov. Retrieved 21 September 2015. ^ a b "The Lurs of Iran". Cultural Survival. Retrieved 21 September 2015. ^ Tore Kjeilen (19 August 2008). "Talysh - LookLex Encyclopaedia". I-cias.com. Retrieved 21 September 2015. ^ "AZERBAIJAN vii. The Iranian Language of Azerb – Encyclopaedia Iranica". Iranicaonline.org. Retrieved 21 September 2015. ^ "TURKIC LANGUAGES OF PERSIA: AN OVERVIEW – Encyclopaedia Iranica". Iranicaonline.org. 15 April 2010. Retrieved 21 September 2015. ^ "IRAN v. PEOPLES OF IRAN (1) A General Survey". Encyclopædia Iranica. 29 March 2012. Retrieved 17 October 2013. ^ Library of Congress, Federal Research Division (March 2006). "Country Profile: Iran" (PDF). p. 5. Retrieved 21 April 2008. ^ a b "Minorities in Iran: Nationalism and Ethnicity after Khomeini - Rasmus Christian Elling - Google Books". Books.google.com. 19 February 2013. Retrieved 21 September 2015. ^ Parviz Aḏkāʾi and EIr. "HAMADĀN i. GEOGRAPHY". Encyclopædia Iranica. Retrieved 21 October 2013. ^ Michael Knüppel, E. "Turkic languages of persia". Encyclopædia Iranica. Retrieved 19 September 2013. ^ "AZERBAIJAN vi. Population and its Occupations and Culture". Encyclopædia Iranica. 18 August 2011. Retrieved 18 August 2012. ^ "QAŠQĀʾI TRIBAL CONFEDERACY i. HISTORY – Encyclopaedia Iranica". Iranicaonline.org. Retrieved 21 September 2015. ^ "Jewish Population of the World". Jewish Virtual Library. Retrieved 21 September 2015. ^ "IRAN: Life of Jews Living in Iran". Sephardicstudies.org. Retrieved 21 September 2015. ^ "Conversion of Religious Minorities to the Bahá'í Faith in Iran". Bahai-library.com. Retrieved 21 September 2015. ^ "Iran Mandaeans in exile following persecution". Alarabiya.net. 6 December 2011. Retrieved 17 December 2011. ^ "Religions\publisher=Lexicorient.com". Retrieved 21 September 2015.